Must Have of the Day: Discover the new Dolce & Gabbana girls' White Tulips Print Collection for Fall Winter 2016 2017 and get inspired! 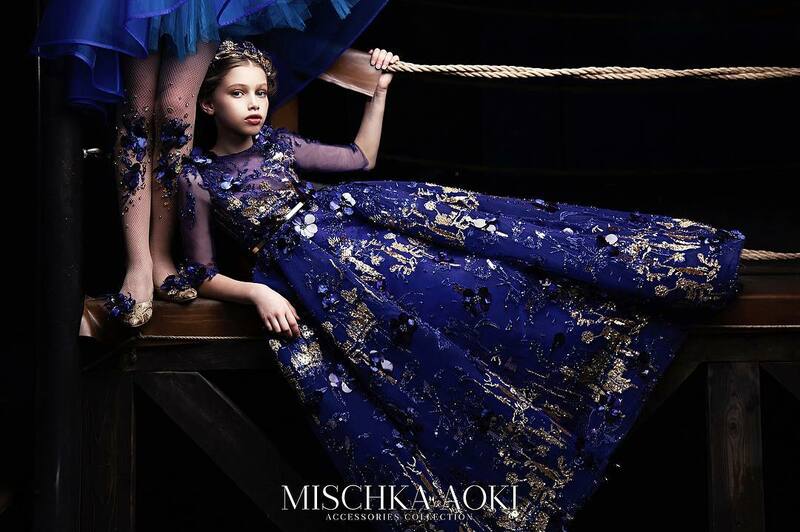 Dolce & Gabbana’s Fall -Winter collection celebrates the modern day princess. Inspired by classic fairytales like Cinderella and Snow White, the new line was defined by the label’s signature feminine silhouettes and classic prints. Discover the new Dolce & Gabbana girls' White Tulips Print Collection for Fall Winter 2016 2017 and get inspired! 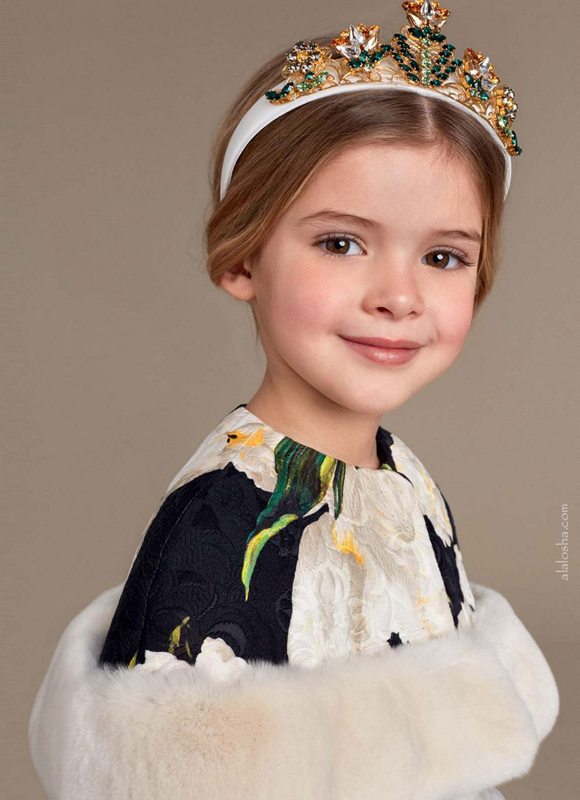 Girls white tulip and fur trimmed cape by Dolce & Gabbana. This beautiful jshoulder cape is made with acquard fabr, woven with the designer's white tulip print and trimmed with real fur. It fastens at the front with poppers and is lined in a silky satin fabric. Girls black and white tulip print silk dress from Dolce & Gabbana. Made in duchesse silk, the fabric has a lovely sheen and slight stiffness, maintaining its beautiful shape. The sleeveless bodice is fitted, with a round neckline and gathered skirt at the waistline, flaring out into box pleats. 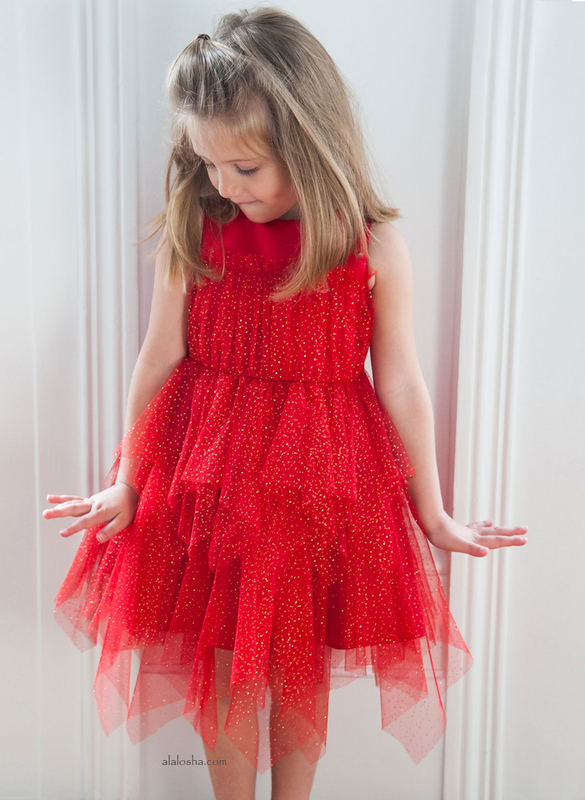 There is a detachable petticoat underneath with tulle netting, a satin lining and concealed back zip fastening. Girls black satin, tulip and crystal hairband by Dolce & Gabbana. This fabulous hair accessory is ornately decorated with brass filigree which is set with beautiful, hand-painted brass tulips and real crystal stones in shades of green, white and pink. An embossed brass logo plate is stitched at one end. A wonderful finishing touch to a special occasion outfit. Fabulous reversible black coat by Dolce & Gabbana, featuring a beautiful, white and green tulip print on one side and luxurious real black fur on the other. Both sides have a stand-up collar which extends into a scarf, and side pockets. This sumptuous coat has a concealed popper fastener down the front and comes with a protective fabric cover. 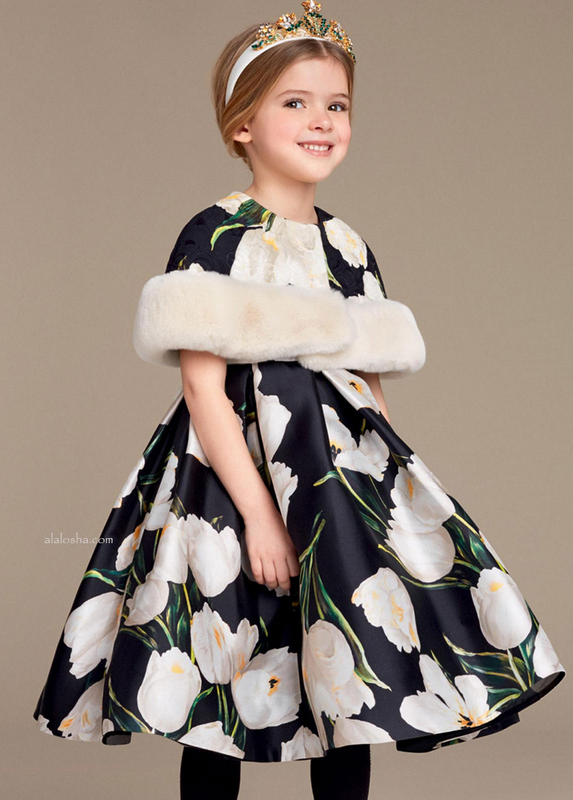 Girls gorgeous silky feel, super soft down padded coat by Dolce & Gabbana. A warm coat with a silky lining and soft fur trim around the hood. It is black with the designer's white tulip print. For extra protection against the cold it has ribbed inner cuffs and it fastens with a zip at the front.